After three teaser videos with the looming date of today, Olympus has finally announced their new camera: the E-M1X, a pro-series body with an integrated vertical grip and new stabilizing and autofocus technology. This camera promises to free you up from having to bring a tripod and even ND filters along with new integrated technology and features. The E-M1X boasts “the world’s highest stabilizing performance,” using a brand new gyro stabilized sensor which can provide up to 7.5 stops of stabilization when combined with the 12-100mm f4 IS PRO lens, or 7.0 stops alone, making it impressively good for handheld video and low-light shooting. The new stabilizer also makes a new Handheld High-Resolution shot mode possible. Much like the high-res shot mode present in the E-M1 Mark II, the camera takes multiple images in succession while moving the sensor slightly, and then stitches it into a 50-megapixel file; though on the E-M1X, the camera does not have to be on a tripod for this to work, allowing for more freedom. However, using it on a tripod will enable an ultra-high resolution 80-megapixel file. Also new in the camera is an artificial intelligence (AI) based deep learning autofocus algorithm, which has been designed to recognize motorsports, airplanes, and trains, and track the optimal area, such as a driver’s helmet. 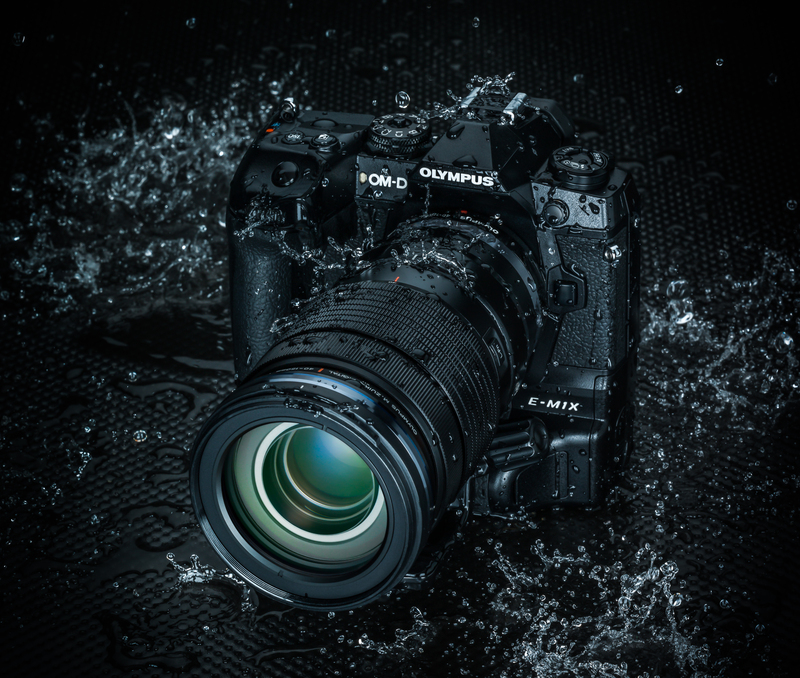 Combined with the same 121-point all cross-point on-chip phase detection found in the E-M1 Mark II, and with the support of new Dual TruePicVIII imaging processors, it provides a fast and precise autofocus system. The new imaging processor also supports a Live-ND feature, which combines multiple images to provide the effect of slow shutter speeds without the need to carry an ND filter. A new optical design levels up the same 120fps progressive scan viewfinder found in the E-M1 Mark II, making it now a viewfinder with a 0.83x magnification (comparable to many SLRs). The camera is expected to begin shipping in late February at a price of $3899.99. In addition to the new camera, Olympus also announced that they will release a silver version of the E-M1 Mark II, as well as a new FL-700WR Flash and wireless radio commanding and receiving units. They have also announced development of a new lens, the 150-400mm F4.5 TC 1.25x IS PRO. This lens has a built in 1.25x teleconverter, and will cover a full-frame (35mm) equivalent range of 300-1000mm. Image stabilization is also built into the lens, which is expected in 2020. The lens will be compatible with the 2.0x teleconverter, also announced to be in development and expected in the summer of 2019. Check out Dave and Ev’s review of the E-M1X below. Kaitlyn is a craft beer enthusiast and self-labelled film nerd. Suitably, she is one of the hosts of Calgary's Beers & Cameras meetup group. She also drinks too much coffee and wants to see too many places. When not helping coordinate events or exploring whatever city, town, or backroad she can, she also works as a freelance photographer and assistant.